Bai Lin black tea is one of Fu Jian province's three famous Gongfu teas (the two others are Zheng He and Tan Yang). This is also one of the oldest black teas in the world and one of the earliest teas to be exported to foreign countries. Ju Hong means Tangerine Red - so called because of its amber orange infusion and also the tea has a hint of dried tangerine flavor. Very smooth tea with a hint of of dried tangerine peel flavor and aroma. It gives a sweet aftertaste after a few cups. This tea blends very well with sweetened milk for added flavor and extra smoothness. 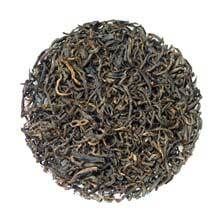 Bai Lin Ju Hong tea is made up of spring-picked tea leaves and buds. Golden-black in color.